Are missing teeth causing you social or physical discomfort? Does having missing teeth make you feel less confident, and less likely to put yourself in social situations? Has it made it harder to eat the foods you love, or even speak? We understand that missing teeth can be an immense source of emotional distress and physical discomfort, and we want to help our patients suffering from tooth loss restore the confident smiles they deserve. We offer a couple of different treatments that can be used to help fill in the gaps caused by missing teeth. One of the best options for those who have lost a few teeth is a treatment called a dental bridge. A dental bridge is a special dental apparatus that looks like natural teeth, and functions like them too. 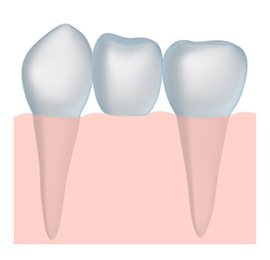 Dental crowns are placed on either side, and the dental bridge acts as a “bridge” between them. Dental bridges are a great way to fill in gaps in your smile and restore the beauty and function of your teeth. Every dental bridge is custom made to fit the needs of each individual patient. When you receive your dental bridge from us it will fit and function correctly–and look great too! A dental bridge from Inspire Dental will be customized to blend in perfectly with your natural teeth. No one will know that you are missing teeth! Dental bridges can help prevent wear and tear on your other teeth. When you lose teeth, you compensate for that loss by chewing more on the opposite side of your mouth. This can cause your teeth to wear down unevenly. A dental bridge can restore your ability to chew on both sides of your mouth and help prevent further uneven wear. Another great option that we offer here at Inspire Dental is dental crowns. In the past getting a dental crown could be a time consuming process, but thanks to modern dental technology at Inspire Dental we can offer another more effective option. CEREC allows us to create custom-made, high quality porcelain dental crowns for our patients – all from the convenience of our office. In as little as just one visit, you can have a brand new dental crown designed specifically for you and your smile. If you have lost teeth, a dental bridge can be a great way to get functionality back and restore your smile. If you have questions about our dental bridges, please contact us today!